The Conquistador’s journey ended one game away from the USCAA Championship final. The semi-final game was decided by just one point, in Uniontown, Pennsylvania against Rochester College. Coach Thatcher was very proud of his team this season. The leadership and skill of the seniors and freshmen led the team to the USCAA National Tournament. One year ago, the Conquistadors entered the USCAA National Tournament with a record of 13 wins and 16 losses compared to this year where they ended the season with a record of 24 wins and 6 losses. Coach Thatcher has changed the culture and chemistry of the Conquistador basketball team. The 2018 season saw 12 new players on the roster. 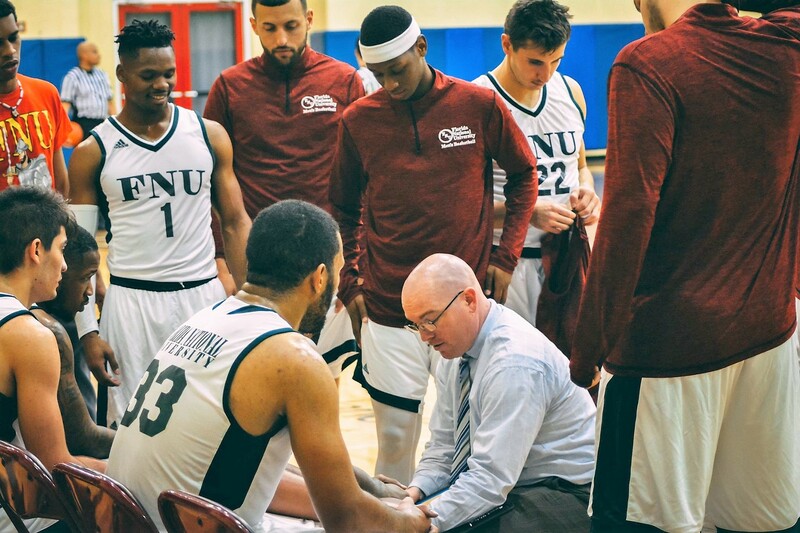 The Conquistadors were ranked number one in the country for six consecutive weeks during the season and entered the USCAA national tournament as the number one team in the nation. Florida National University will induct Quantavis Hall into the Florida National Hall of Fame for holding every record in Florida National University history. Quantavis scored more than 1600 points in his career. Christopher Hall was a phenomenal scorer this season and holds the record for the most points scored in a game. Terrence Johnson was consistent and dependable all season. Both Christopher Hall and Terance Johnson made First Team All American. Center Jessy Cantinol played beyond expectations every night. Ivenor Rosier not only was an Academic All-American but also played a major role as one of the best point guards to come off the bench and helped lead his team to a successful season. Freshman Jose Benitez, a guard, made an impact and played big minutes for the Conquistadors. Freshman Kenneth Santos, a shooting guard, added scoring power and consistency. He made more than 120 three-pointers and was recognized as a third-team All-American. Freshman Christian Anglada gave Coach Thatcher confidence with his defensive role and presence on the court. All three freshman will play a major role next season. Coach James “JJ” Thatcher had the best season of his career as head coach of the Conquistadors. Coach Thatcher looks to keep the program moving in the right direction and continue to build a team with a set of shared attitudes, values, goals, and practices that characterize the Conquistadors.